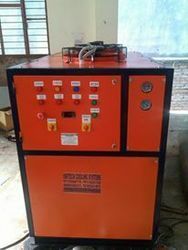 Prominent & Leading Manufacturer from Ghaziabad, we offer glycol chiller. As a quality-oriented organization, we are focused to provide our clients excellent quality Glycol Chillers. The offered range is manufactured using high grade raw material and advanced technology. The offered chillers are used in different processing industries are availed in different designs and other related specifications, in order to meet the variegated expectations of our valuable customer. Our provided range is rigorously tested by the team of our professionals. Furthermore, our clients can avail these chillers from us at market leading prices. Looking for Glycol Chiller ?